The nautical look is a trend that will forever be in fashion. Lucky for me I'm a big fan, which means that there is always an endless amount of sailor-inspired pieces that I can get my hands on. There's something about sailor collars, stripey prints and large brass buckles that gets me in a frenzy. Whilst out shopping, my eyes are drawn to horizontal stripes and anything that slightly resembles "sailor." It is then followed by an immediate purchase. The nautical look is a fresh change from the overdone florals and botanical prints seen this season. And there is nothing that looks more chic than the classic stripey sweater. Here is my own version of the sailor dress. 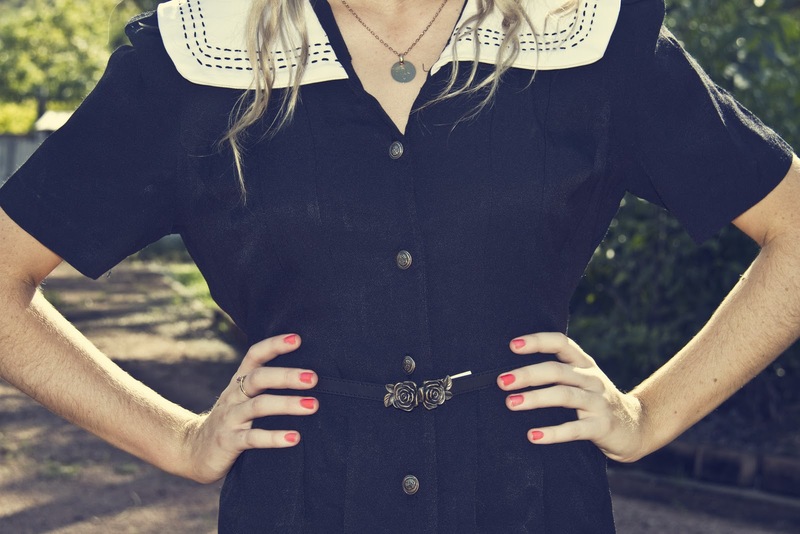 I found this little gem on ebay <3 I am in love with the large white collar and black stiching detail...and of course the brass buttons. I chose to keep the look casual with black sandals and a black belt. I love the sailor look! Stripes are my homeboy. The collar on this is simply awesome. Love the look! the nautical look is so timeless! that rose belt is absolutely adorable. you are such a doll with your blond hair and blue eyes!